St. Peter's German Redemptionist Fathers Cemetery has also been known as Old Saint Peter's Cemetery, Richmond Cemetery and Saint Peter's Cemetery. 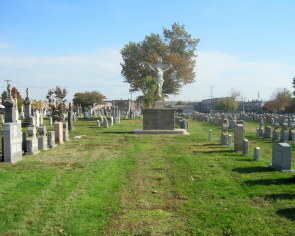 This cemetery is located in the Port Richmond area of Philadelphia. 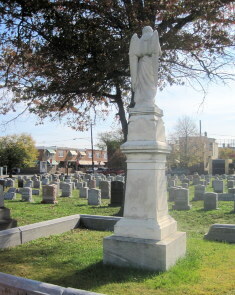 St. Peter's Cemetery takes up one city block and was founded by the German population of St Peter‘s Church (5th and Girard Ave, Philadelphia PA). 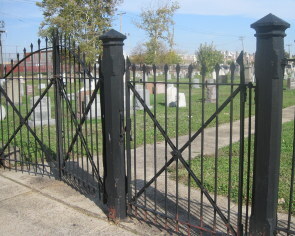 The sky line of downtown Philadelphia can been seen from this old German burial ground. St Peter’s Cemetery is not identified with a known address. The cemetery is located between Belgrade and Almond Streets, and Tioga and Venango Streets. The main gate to St. Peter’s is situated on Tioga Street. 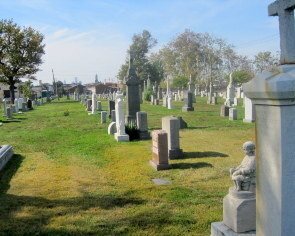 St. Peter’s is a quaint cemetery located amongst the row homes of the neighborhood. Little information is written about St. Peter’s Cemetery. Most web searches will refer one to contact Holy Redeemer Cemetery, 4268 Richmond St, Phila., PA 19137 for spiritual records. 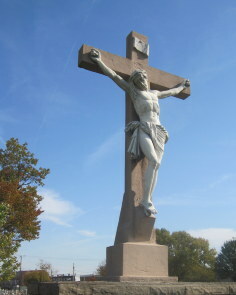 Holy Redeemer Cemetery was founded in 1886 by St. Peter’s Church. On the German side of my family, the Windfelders and the Dengels were buried in St. Peter’s Cemetery during the late 1800’s and early 1900’s. St. Peter’s Cemetery remains open and is not exclusive to the German population. In fact, Polish surnames seem more common than most surnames. 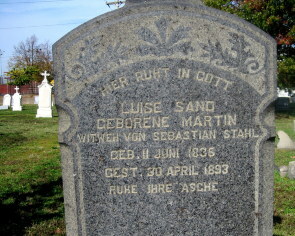 Some of the gravestones were hand chiseled in the German language. These aged German gravestones were made from a dark gray/black stone. To this day, some of the engraved German headstones, remain strong and clearly defined--almost without any wear from time.